The filter needs to be replaced regularly, but the original price is expensive? Filter leaks or appears noisy when it works? The water coming out of the filter has other taste? Please believe in us, Vitalium can make you no longer have to worry about these problems. Fresh & Pure Water: Create better tasting water for drinking and making beverages as well as clean, clearer, healthy ice. W10413645A, W10238154, KENMORE-469903, 9903, PUR FILTER2, EDR2RXD2, p6rfwb2, compatible to the leading brand Whirlpool, Kenmore, KitchenAid, Maytag, Amana and JennAir. NSF CERTIFIED & PREMIUM FILITRATION: Certified by IAPMO R&T to NSF/ANSI 42 for chlorine reduction. Traps lead, chlorine , odor, rust, turbidity, heavy metals and harmful sediments with advanced filtering technology, it can improve personal physique and your body ability to cope with allergy. SIX-MONTH FILTER LIFE: Sustainable use for 6 months or 300 gallons (Depends on water quality and level of contaminants). Please remember to replace it that could protect your family's health continuously. KIND REMINDER: Flush 4 gallons of water through the water cartridge before use to minimize contamination (replacement is safe and easy). 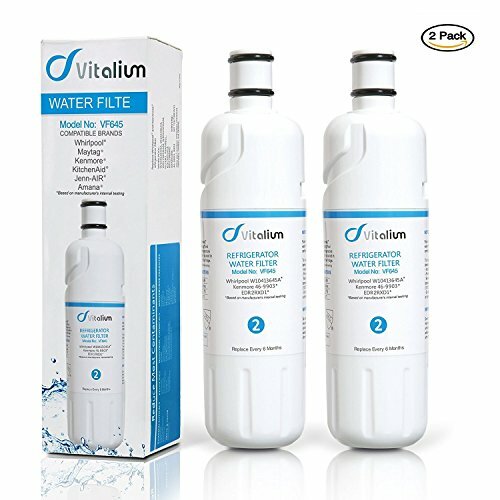 WITH 60-DAY GUARANTEE: 100% satisfaction guaranteed - If you are not completely satisfied with your purchase of Vitalium, please contact us at any time, we'll give you a full refund or replacement!